The other day I was on Pinterest and came across the cutest, little pink beach cottage. 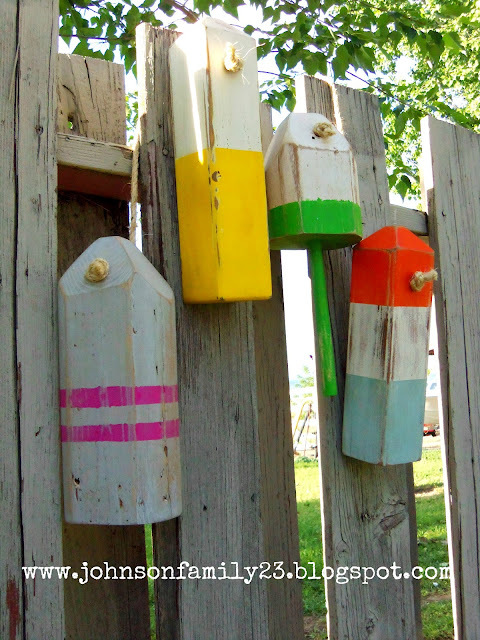 I don't know about you, but I daydream about one day, having an adorable beach cottage with a picket fence out front decorated with brightly colored buoys. 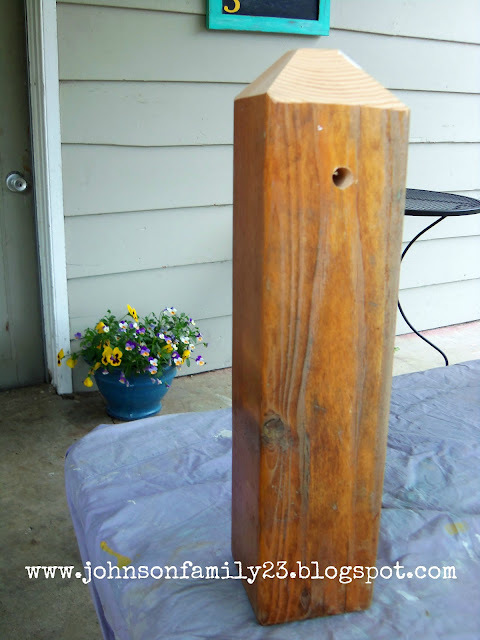 My husband happened to have a bunch of scrap wood out in our shed, and he was totally up for the challenge. Plus, any excuse to play with his power tools...he was more than happy. Here is how one of them started out. He trimmed up all four sides and made them come to a point. Then, he cut the very tip off and drilled a hole straight through. He made it imperfect on purpose. We wanted it to look rugged and worn. 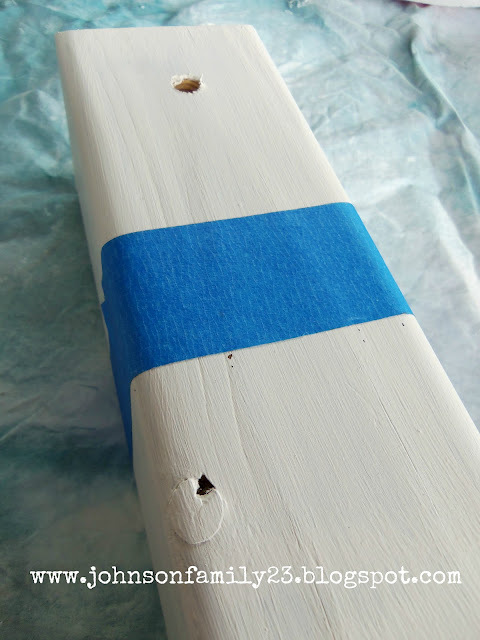 I painted it all white and taped it off where I wanted the color separation. For this one I chose Orange, White and a Light Blue. I originally started out making only two, but my husband was having too much fun making them for me. We made four all together. 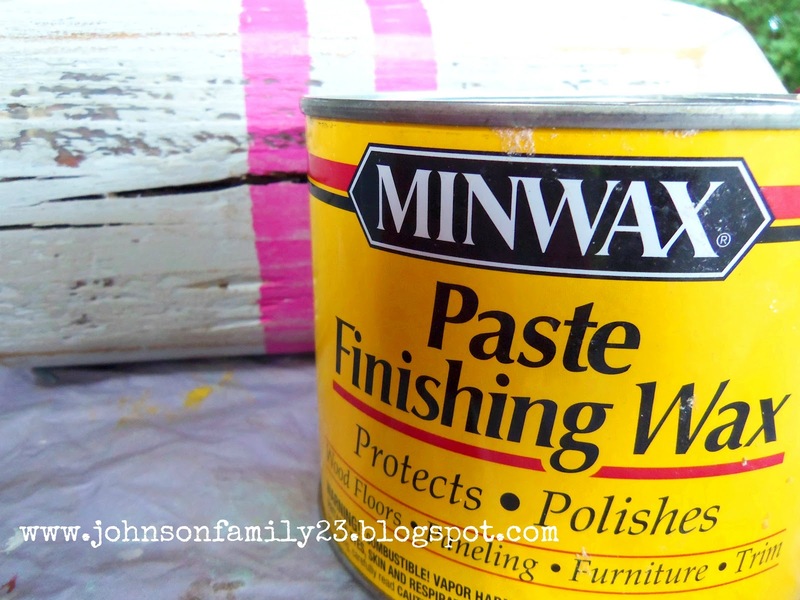 After I was done painting and sanding them(they have to look used) I put a thick coat of finishing wax on them. Here they are strung up with some rope and hung from our back fence. 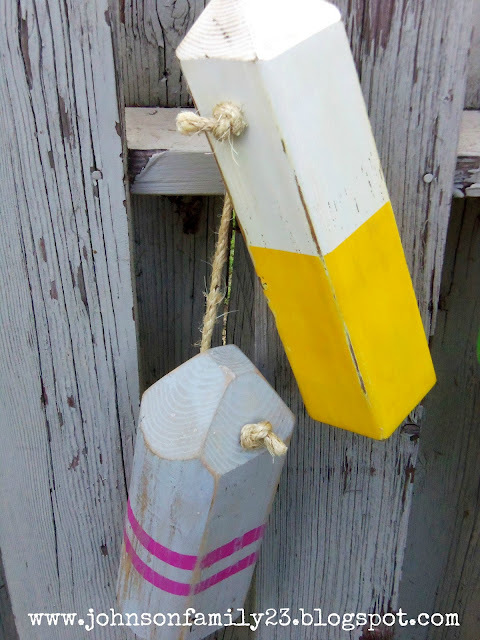 My husband took the smallest one and drilled a hole in the bottom then inserted a dowel to make it look like the many buoys you see hanging everywhere along the coastal waters of Maine. After researching them a bit, I learned that they were originally made for catching Lobsters. 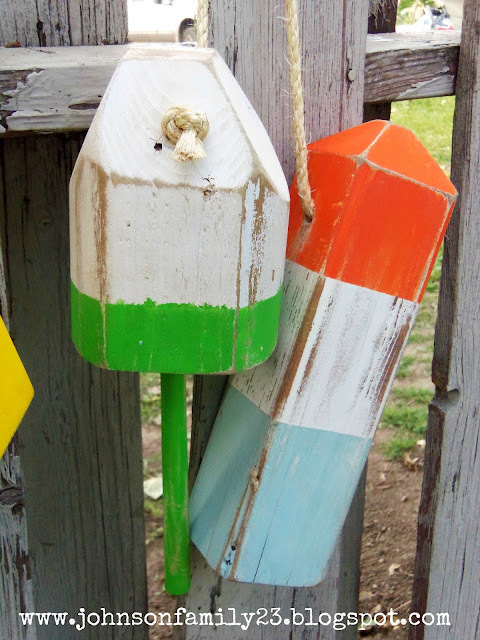 Each fisherman would have their own colors so they were easy to decipher. I loved this project. It was something my husband and I had so much fun creating. Plus, it was Free other than the .89 cents we spent on the rope. Under a dollar is not too bad. 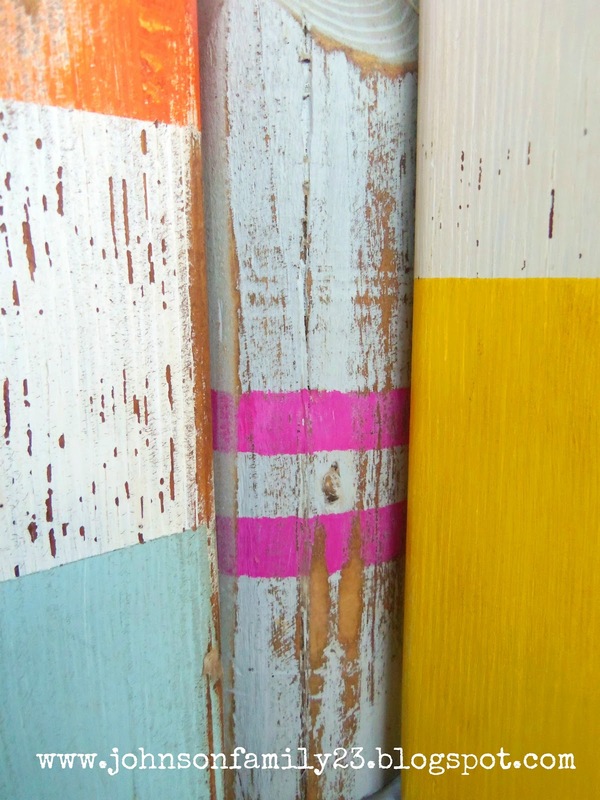 Summer is definitely coming and these cuties are giving our back patio some East Coast charm. I love it! Super cool! I love these! 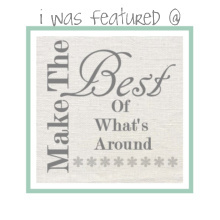 Thanks for linking up to Terrific Under Ten! CUTE! I have been wanting to do this for so long now, and we have tons of scrap wood as well. Thanks for the inspiration! Wow. These came out great!! So funny, my husband made some buoys as well (and loves power tools)! 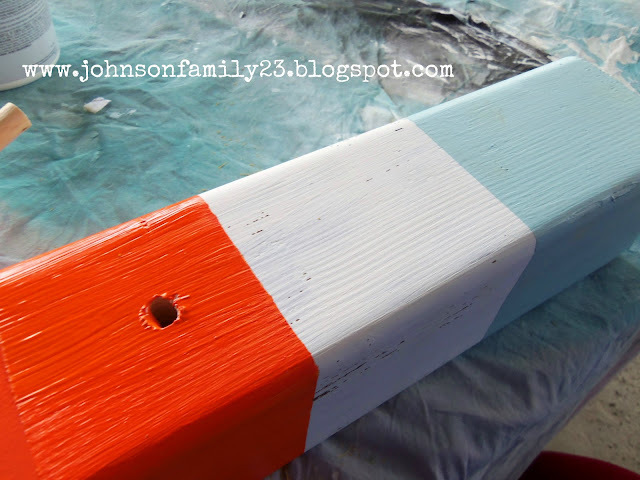 So sweet you could enjoy something like that with your hubby, and they turned out so fun! I love your buoys. I have buoys hanging on my fence and walls, but they are all buoys we found on the beach and spray painted in our colors. 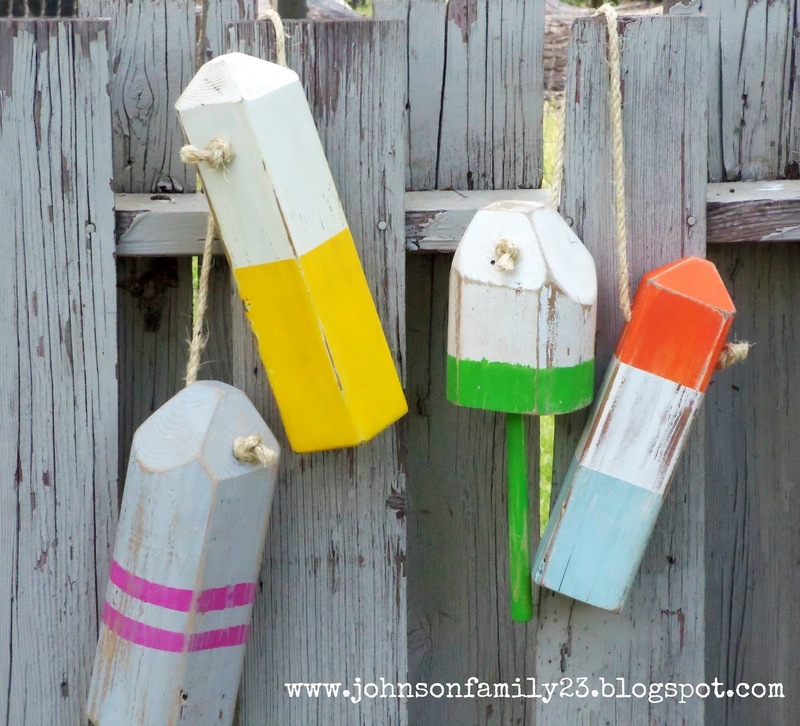 I wish my husband was handy with power tools so he could make me some wooden buoys. In his defense, he is an artist and a gourmet cook. Thanks for sharing such a cute project.